Shannon Conley of Arvada, Colo., 19, is charged with conspiring to help ISIS, the militant group wreaking havoc in Syria and now Iraq. Newly public court documents describe the backstory leading to her April arrest. Federal agents appear to have gone out of their way to persuade Shannon Conley of Arvada, Colo., to abandon plans join jihadists in Syria, but ultimately arrested her in April at Denver International Airport as she allegedly pursued her intent, according to court documents released Wednesday. Ms. Conley, a 19-year-old nurse’s aide and a Muslim convert, planned to travel to Syria to join an online suitor, who told her he was affiliated with the militant group the Islamic State of Iraq and the Levant (ISIS), the militant group that has recently overtaken parts of northern Iraq, the FBI affidavits allege. She has been held in Denver County Jail since her arrest and faces a federal charge of conspiring to help a foreign terrorist organization, which carries a penalty of 15 years in prison, according to The Associated Press and the Los Angles Times. FBI agents arrested Conley on April 8 at the airport as she was boarding a plane to leave the US. Details of the investigation leading up to her arrest came to light with Wednesday’s release of previously sealed court documents. The agents reached out to Conley’s parents to help dissuade their daughter from her plan. Her father told an agent that Conley had asked for his blessing to marry, which he refused, the documents state. In an FBI interview on April 4, four days before her arrest, Conley told agents there was no way to stop her from traveling to Syria to meet her suitor, where she planned to be a housewife and serve as a nurse at his camp. Agents apprehended her on April 8, while she was walking down the jetway toward a plane bound for Germany – what would have been the first leg of a trip to Syria. Conley first came under FBI scrutiny in November, when the pastor and security director of the Faith Bible Chapel in Arvada alerted local police that she had been wandering around and apparently taking notes about the layout of the FBC campus, court documents show. She reportedly became confrontational when church staff approached her and started talking about terrorism. During a November interview, Conley told officers that she had started attending FBC services to meet people of other faiths, but was put off by the church’s support for Israel. In multiple subsequent interviews during the next several months, the 19-year-old told the FBI about her desire to wage jihad abroad. More than 100 American-born Muslims have left US soil to train with Al Queda-inspired groups such as ISIS, New York Police Department terrorism chief John Miller told the New York Daily News. The majority of these fighters have been men, but Conley is not the first American woman to be apprehended for plans to carry out jihad. Michigan-born Coleen LaRose, known as “Jihad Jane,” is currently serving a five-year sentence for plotting to kill a Swedish cartoonist whose illustration of the head of the prophet Mohammed on the body of a dog sparked outrage among the international Muslim community. To those who knew her, Shannon Maureen Conley was a bright teenager lost in middle-class suburbia who went searching for love and purpose. She thought she found it half a world away with a Tunisian man 13 years her senior who promised marriage and holy war. The plan went only as far as Denver International Airport, where Conley was arrested in April as she tried to board a plane to support Islamic fighters in Syria. Conley told the FBI she was determined to be "defending Muslims on the Muslim homeland against people who are trying to kill them." If that was illegal, she added, she "would rather be in prison than do nothing." The 19-year-old Colorado woman is now under federal indictment, charged with conspiracy to aid Islamic State, the extremist military force with ties to Al Qaeda that has been on the march across Iraq and Syria. Her transformation from a smiling girl, often clad in shorts or jeans and a floppy hat, who chatted with friends, to a solemn, dreamy young woman wearing the long dresses and flowing head scarves of traditional Islam, is one that neighbors and school administrators said came relatively suddenly. She had been "among the brightest kids" at Arvada West High School, said principal Rob Bishop, adding that she was the daughter of a professor at a Catholic university, was enrolled in honors courses and presented no discipline problems. Sometime during her junior year, Bishop said, Conley had begun to wear traditional Muslim dress. Several girls complained that she was kneeling on the bathroom floor three times a day for her prayers. "I talked to her about accommodating her to get her out of the bathroom and move her into an office in our school’s front offices," Bishop said. Conley told him she was converting to Islam and seemed grateful for his support. Neighbors, too, noticed the change in her appearance, and said she often seemed lonely and reflective. Many neighbors were not closely acquainted with Conley or her parents. Her mother, Ana Marie Conley, is an associate professor of economics at Regis College, while her father, John Conley, works in the computer field and teaches martial arts out of his garage on weekends, according to neighbors. Robert Taylor, who lives nearby, said he would sometimes see Conley sitting alone in a neighborhood park, drifting silently on the playground swing. "She just seemed kind of lost," he said. On Conley’s Facebook page, she began calling herself Halima, an Arabic name meaning "gentle and mild-mannered," and described her work as a "slave to Allah." In fall 2013, Conley began showing up at Faith Bible Church, a Christian mega-church not far from her home known for its support of Israel. Pastor George Morrison said members became unnerved by the frequent sightings of the young woman in Muslim dress, carrying a large backpack and wandering in and out of classes and services. The church has a history. In December 2007 a gunman opened fire at the dormitory of a missionary group that shares campus space at the church, killing two and wounding two others. Morrison said staff repeatedly asked Conley if she had questions about the church or wanted to join. She declined, saying she was a Muslim doing research. Morrison said he didn’t see her as a threat: "I felt like from the beginning she was a wannabe," he said. Still, on Nov. 3, the church finally asked her not to come back, and four days later, the FBI conducted what was to be the first of many interviews with Conley. According to an affidavit filed in court, Conley was asked why she had gone to the church. "I hate those people," she replied, adding that once church leaders began to watch her, she decided to goad them by pretending to take notes. "If they think I’m a terrorist, I’ll give them something to think I am." She told FBI agents she had signed up for a weekend with the U.S. Army Explorers, a career program offered under the umbrella of the Boy Scouts of America, to be trained in military tactics and firearms. Her intention, she said, was "to use that training to go overseas to wage jihad." FBI agents initially interviewed Conley’s parents in February, asking them to engage their daughter in "candid conversation" about Islam. Though they have declined to be interviewed by reporters, it is apparent from court documents that the Conleys’ alarm about their daughter was growing. On March 10, the FBI said, John Conley called the FBI and told agents he had not realized that his daughter had become so extreme. A few days later, he recounted walking in on a Skype conversation his daughter was having with a man she said she had met online. The man, whose name is redacted in the complaint, asked Conley if he could marry his daughter and bring her to the Middle East. Her father refused, but Conley said she was going anyway. On April 1, John Conley said, he found on his desk a one-way ticket to Turkey for his daughter and called the FBI. In all, federal agents met with Conley eight times between Nov. 7 and April 8, and six times with her parents. Court documents describe agents trying to dissuade her from the notion of jihad, and suggesting the option of working for a humanitarian organization. But Conley’s determination only appeared to grow. The Islamic State of Iraq and Syria, as the group was called until recently, fighter she had met online was her "suitor," she said, and she planned to travel to meet him. They would live near the border between Turkey and Syria. She would be "a housewife and the camp nurse," and if necessary take up arms, she said. "I wouldn’t like it … but I would do it." She made it as far as Denver International Airport, where on April 8 she checked in for her flight to Frankfurt, with a connection to Turkey, and made it halfway down the jetway before she was confronted by the FBI and taken into custody. The U.S. attorney and FBI have declined to comment on the case, as has Conley’s public defender. Since her arrest, the initial complaint charging her with providing material support to a terrorist group has been reduced to a conspiracy charge that carries a maximum of five years in prison rather than 15. Back in Arvada, neighbors along Taft Circle are more saddened than fearful. When Conley disappeared in April, they thought she had moved. Once the news broke July 2 and TV trucks began arriving, Taylor slipped a note into the Conleys’ front door offering support. So far, they haven’t responded. Recently at Faith Bible Church, Morrison offered a special prayer for the young woman sitting in a jail cell. "I never thought she was dangerous, but you never know," he said later. "She ignored every warning they gave her. She was crossing a line, stepping into an area that could’ve sucked her into something really bad. I think maybe getting arrested just might have saved her life." ARVADA, Colo. (CBS4) – The Arvada teenager accused of trying to gather information for a Muslim terrorist group was seemingly typical, as described by her neighbors, before her behavior started to change. The FBI arrested Shannon Maureen Conley in April but her case was just made public. She is accused of helping the radical Islamic group known as the Islamic State of Iraq and Syria, also known as ISIS. Conley seemed to be a typical teen. She attended middle school in Loveland, then Arvada West High School before transferring to Ralston Valley then back to Arvada West. Her neighbor, Bob Taylor, said Conley and her family have been living at the same home in Arvada for about two years. They also saw the changes. “When she first moved in she seemed normal, wore clothes most kids wear, then she started wearing the long Islamic garb,” said Taylor. According to court documents, she converted to Islam after meeting a Muslim man online who convinced her to take part in a holy war. She was arrested while boarding a plane with a ticket to Turkey. Her arrest happened after the FBI repeatedly to talk her out of her plans. “Tried to suggest other things she could do to help folks and after all those attempts she was committed to Jihad,” said FBI Special Agent In Charge Denver bureau Jim Davis. Neighbors said they started to notice changes in her behavior. “She would go down the street here to a park and sit on the swing. Swing in that attirre for maybe half an hour at a time. I don’t know if she was contemplating or meditating,” said Taylor. The FBI said Islamic terrorists are recruiting American women through offers of love and going after those most vulnerable in attempts to gain access to the United States. ARVADA, Colo. (CBS4) – An Arvada woman charged with aiding a foreign terrorist organization has agreed to change her plea to guilty. Conley, 19, is charged with conspiracy to provide support to ISIS, or Islamic State of Iraq and Syria. U.S. Department of Justice spokesman Jeff Dorschner said in a statement released Monday morning that a plea hearing has yet to be scheduled in the case. 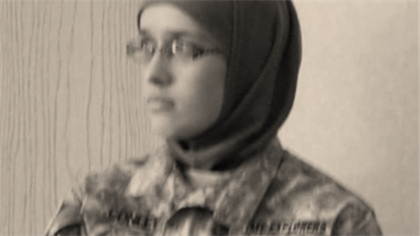 Court documents claim Conley joined the Army Explorers to be trained in U.S. military tactics and firearms, and that she told the FBI she wanted to wage Jihad and to go overseas and fight. She attended middle school in Loveland, then Arvada West High School before transferring to Ralston Valley then back to Arvada West. She also had a number of CDs and DVDs labeled “Anwar Al-Awlaki” that were recovered. Al-Awlaki was the Colorado educated terror suspect assassinated by a U.S. drone missile in Yemen. According to a criminal complaint, Conley’s parents told the FBI they failed to talk their daughter out of her plans. Conley was living with her parents in their Arvada home. The FBI also tried repeatedly to talk her out of going but arrested her earlier this year at Denver International Airport with a ticket to Turkey. Details of the agreement were not part of the court filing. Deals cannot be disclosed until a change of plea hearing, according to Dorschner.